The Byrne Gallery is proud to present All that Glitters, a celebration of the season of shimmer that signals that the holidays are coming near! 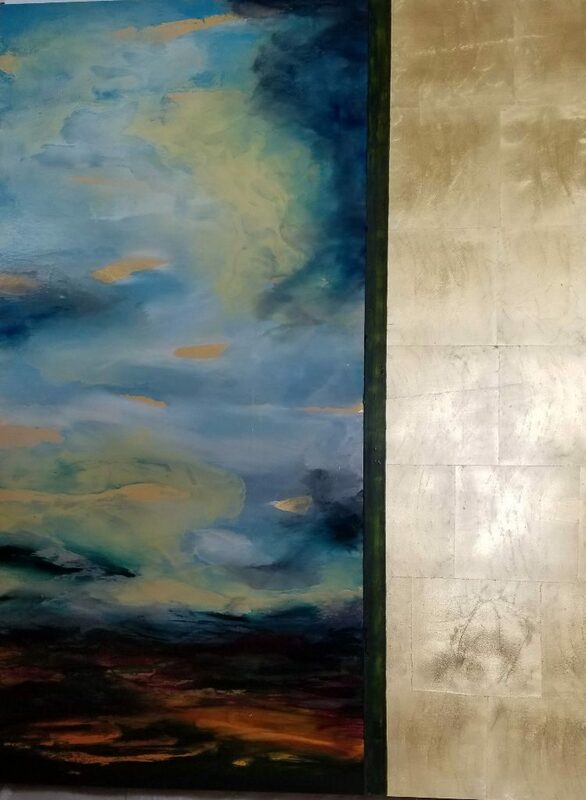 This October’s exhibition features paintings by Gwyn Kohr that incorporate her unique treatment of gold leaf and copper leaf. Sparkle illuminates the horizon line and gives an air of mystery to the atmospheric scenes of mountains and clouds in the distance. Adding the silver lumens to the mix is the sculpture of Gil Ugiansky. 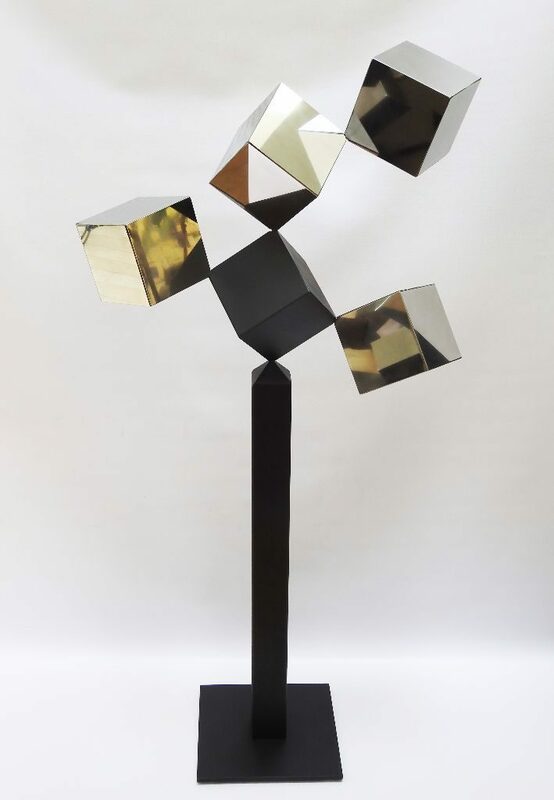 His polished surfaces of stainless steel dazzle viewers with their ability to float in mid-air cantilevered off the edge of a perfect cube that dangles and balances the composition. The exhibit continues through Sunday, October 29. 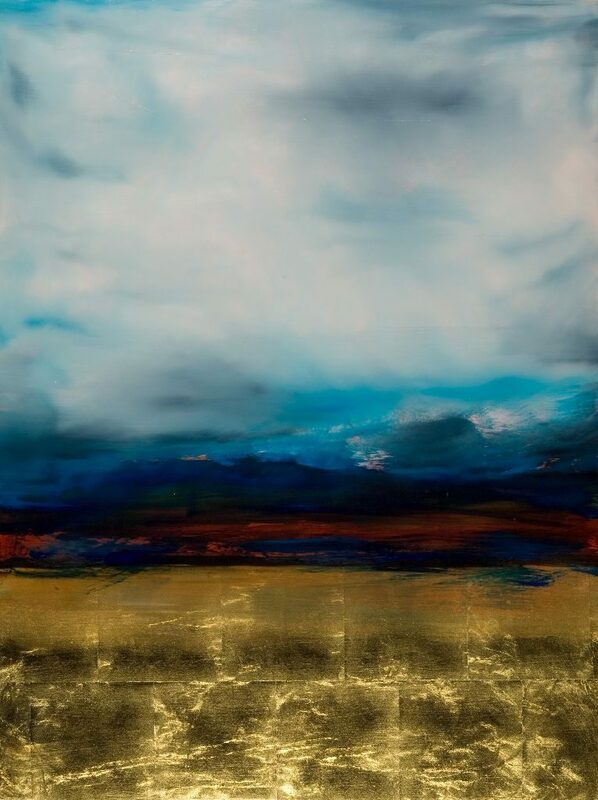 Gwyn Kohr received her Fine Art Degree from California State University. She taught and exhibited extensively in California before moving to Virginia in 2004. Here she has continued her artistic explorations showing with the Byrne Gallery and other galleries in the area as well as in Rehoboth Beach Delaware. She creates textural paintings that are evocative of nature. Within the fluid space of each painting she achieves a balance and integration between form and non-form, abstraction and representation. Most recently Gwyn participated in Senator Mark R Warner’s Arts in Virginia program which showcased the work of Virginia based artists in the nation’s Capitol. Her painting, Transcendence, which is in this show at The Byrne Gallery was exhibited in the Senator’s office in the Russell Senate Office Building. FROM METALLURGIST TO METAL SCULPTOR. 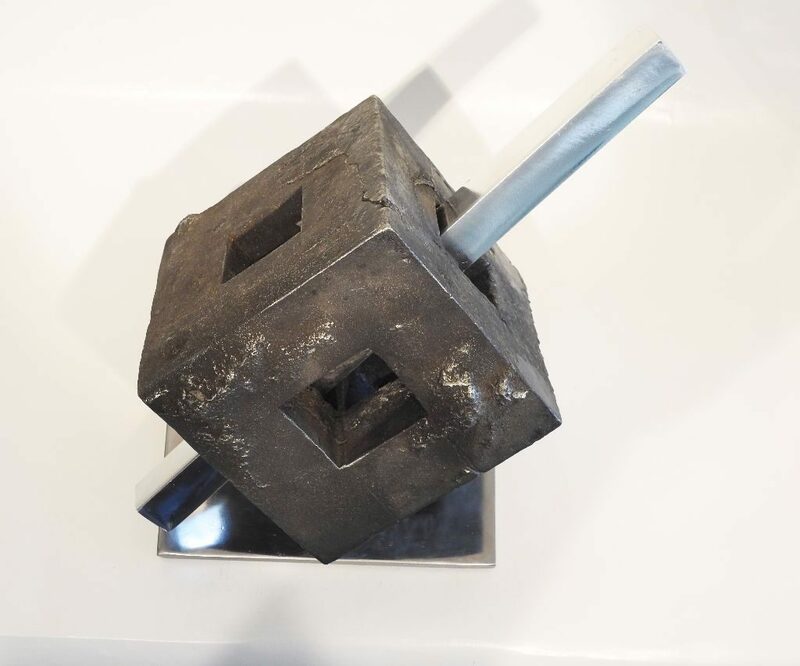 Gil is a metal sculptor who creates primarily non-representational pieces of art in mild steel, stainless steel, aluminum, iron, bronze and occasionally found objects. He is strongly attracted to geometric shapes and shiny objects. Gil grew up in Baltimore, lived in Montgomery County, and currently lives and has his studio in Annapolis, Maryland. He has a B.S., M.S., and Ph.D. in Metallurgical Engineering and spent a good part of his life studying corrosion of metals and looking at art. He has studied metal sculpture under Wilfredo Valladares-Lara. Gil looks to sculptors in galleries all over the world, in particular these for inspiration: Tony Smith, David Smith, Anish Kapoor, Benton Fletcher, Julio Gonzalez, Richard Serra. Gil’s artistic goal is to capture the interest and curiosity of the viewer and elicit the thought: “how is that possible?” or “how did he do that?” And his goal is to do that while maintaining the highest esthetic quality. The Byrne Gallery is located at 7 West Washington Street in Middleburg. Gallery hours are Monday and Tuesday by appointment only, Wednesday–Saturday 11 a.m.–5 p.m., and Sunday noon–5 p.m.